When I was in Montana a few months ago, I felt like I’d arrived in a land where you could theoretically do whatever you felt like doing, few questions asked. It’s an immense, mountainous place where the largest “city” has just over 100,000 people and the population of the entire state is less than that of my home county. You could probably walk in the woods for days or weeks without seeing another soul. You can legally buy and set-off professional fireworks from your own backyard, go gopher hunting just off of a state road or camp on the banks of the Yellowstone River if you feel like it. In places like Montana, the population is so sparse and space so vast that heavily regulating citizen life doesn’t make financial or organizational sense — doing so would only unnecessarily upset people in a state with 6.86 people per square mile (compare to Virginia at 206 people per square mile). Montana is a place you could go if you wanted to disappear. I grew up in the densely populated suburbs of D.C, where life is much more tightly regulated and nature seems to exist in spite of civilization, and in tamer, relatively small and closely managed pockets. In the west, I feel like the opposite is true: Humans have somehow been able to carve out cities, towns and other necessities of civilization despite seemingly insurmountable natural obstacles. I think that going out west this summer really helped me realize just how difficult it is to govern a country as large and diverse as the U.S: You need lots of rules in big cities (especially in the very densely populated D.C to Boston Corridor); otherwise life would be chaotic, dangerous and unmanageable. But in rural areas, having rules — or strictly enforced rules — make no sense because people don’t need to coexist in the way they do in dense population centers. This seems like a very obvious fact, but I didn’t fully grasp the fundamental ideological differences that divide Americans until I really had a chance to see how people live in places very different from the places I’m used to. Anyway, what I’m trying to say is that unlike Montana, Virginia isn’t really the kind of place where one could easily “go off the grid.” It’s too close to D.C, there are too many towns and even the most remote corners of the state are somewhat heavily touristed thanks to a fairly organized national and state park and forest system. This weekend though, I really felt like I was somewhere wild and vast and it reminded of my vacation out west. We started our trip by going fishing on the James River just outside Buchanan, VA. I actually read magazines, cooked dinner and enjoyed the view while my boyfriend fished. By the way, there’s not much going on in Buchanan — no charm, no nightlife, no nice main street. As far as I could tell, the only thing Buchanan has going for it is it’s mountain location on the James River. We saw plenty of fishermen and kayakers on this section of the river. Unfortunately, we didn’t see any fish. 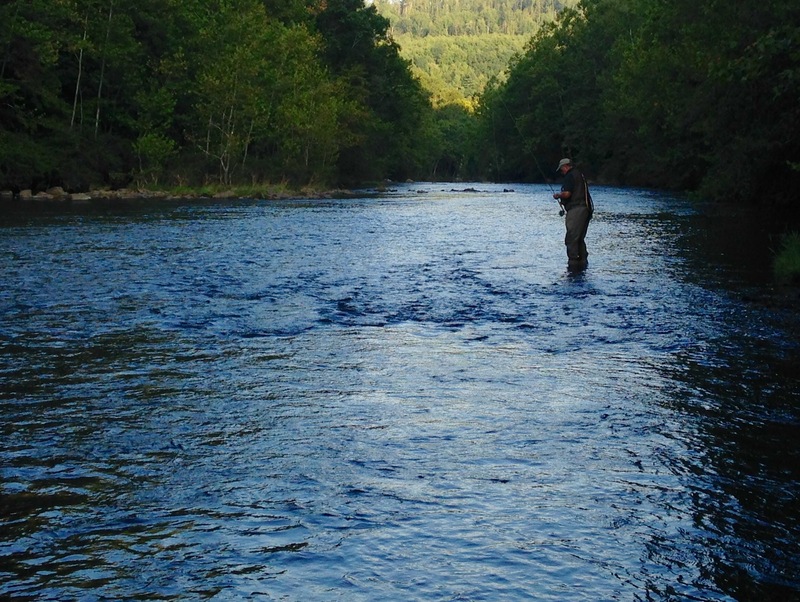 A man fishing on the Jackson River in Alleghany County. 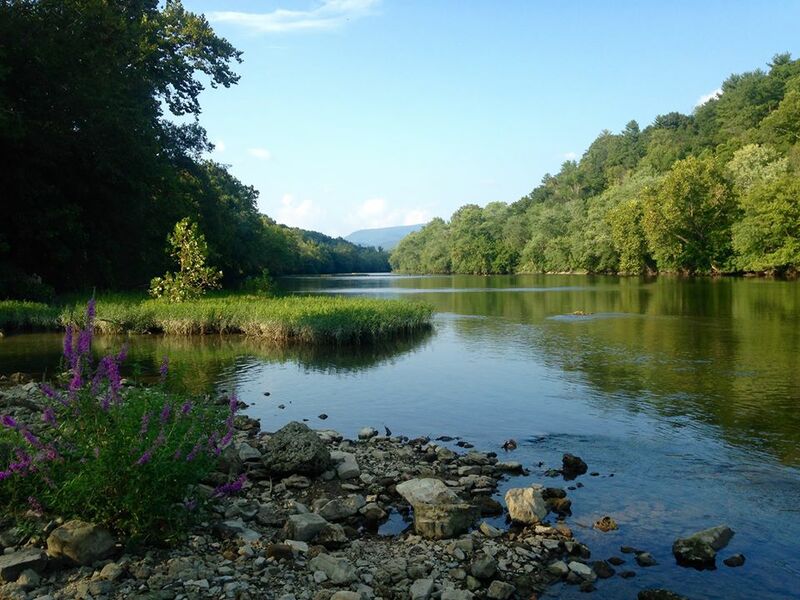 There are only two towns and 16,500 people in Alleghany County, but if you’re into outdoorsy things, there’s plenty to do: Rafting, kayaking, fishing, hiking, road and mountain biking and road biking. If you’re not into challenging hikes, there’s a beautiful and easy 11-mile scenic trail along the Jackson River that passes alongside mountains and historic sites. We didn’t get to it this time around, but maybe we’ll try to bike it next time. 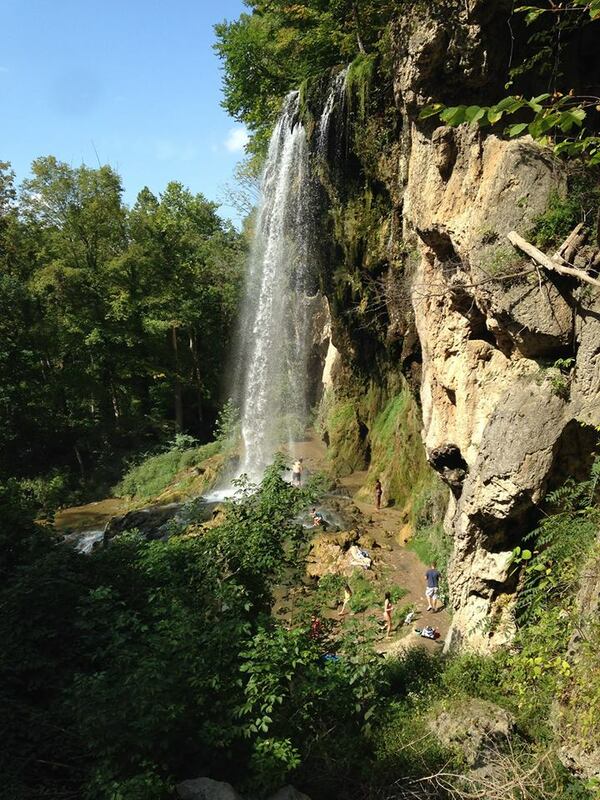 I saw a picture of Falling Spring Falls and decided I wanted to check it out. It’s right off the side of the road and easy to miss if you’re not looking. 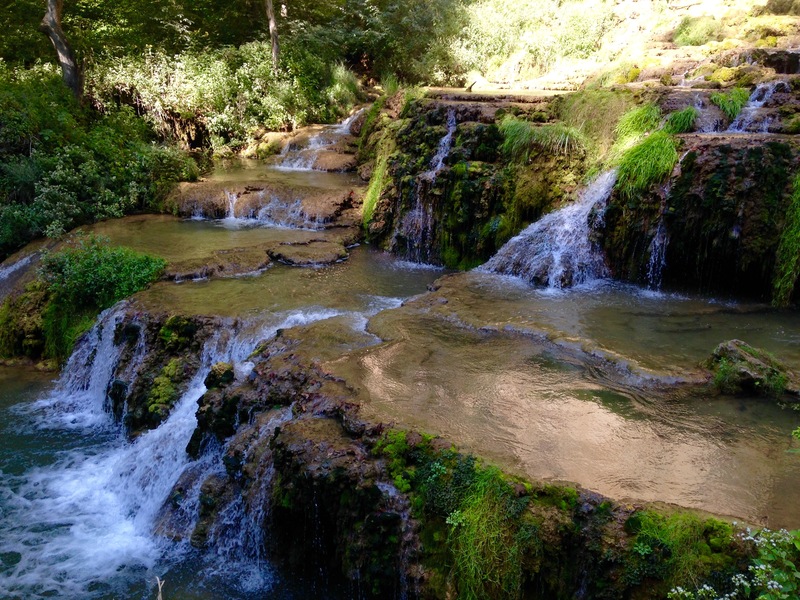 There’s a short and fairly easy trail that leads down to the main waterfall, but there are plenty of small falls, cascades and swimming holes along the way. 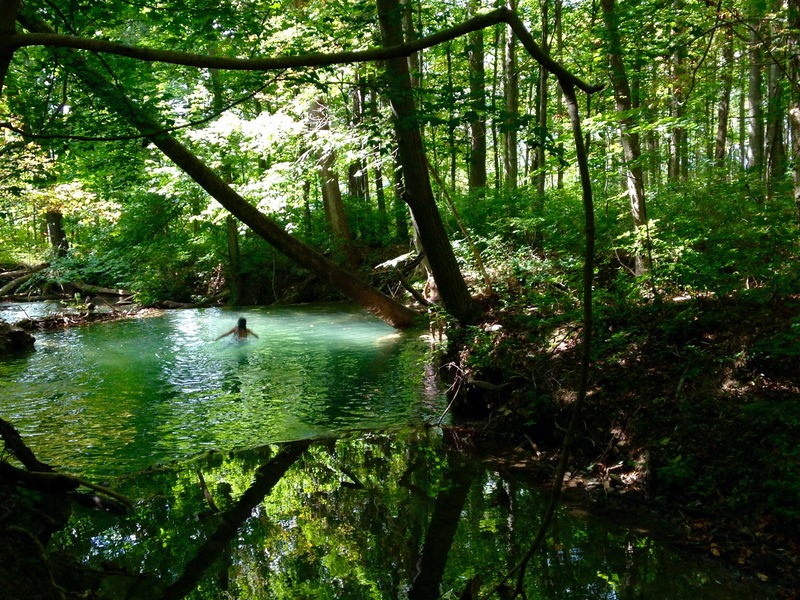 This one is the deepest and most popular of the swimming holes. The trail down to the waterfall passes alongside the green-blue Falling Spring Creek. It’s been a really dry summer and the stream was fairly shallow, but I imagine it gets more a bit higher in wetter summers. 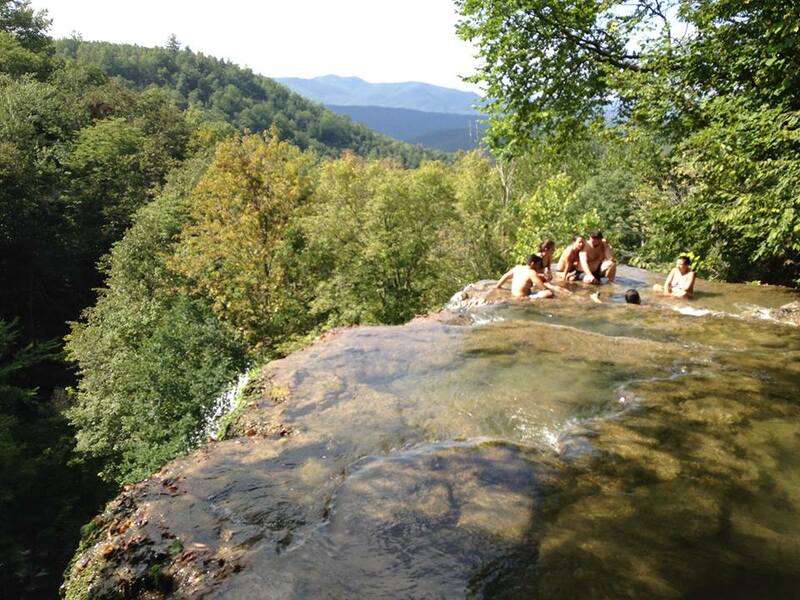 At the top of the waterfall there are about seven or eight swimming holes (2-3 feet deep) that almost look like Jacuzzis. I’m guessing this spot would be much more dangerous after lots of rainfall. 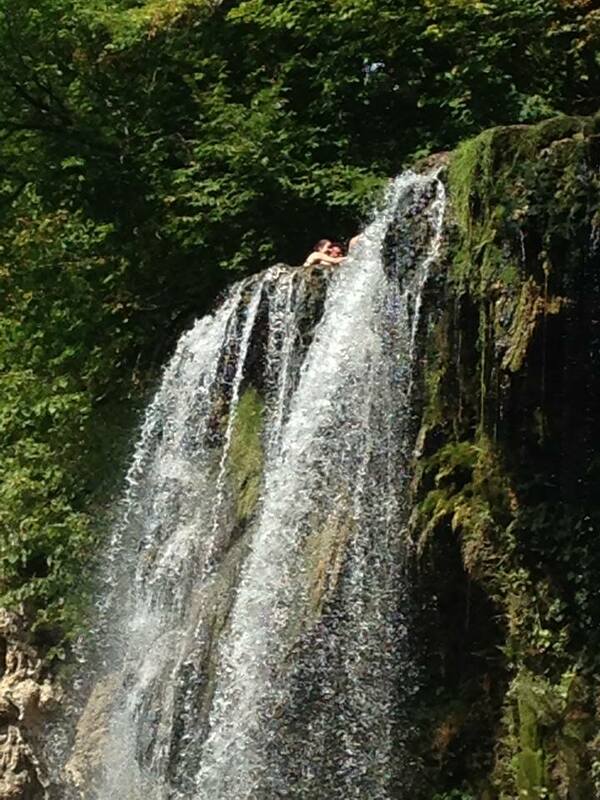 It’s a little blurry, but this is a different view of people hanging out on top of the waterfall. It looks more precarious than it feels. Falling Spring Fall is about 80 feet tall. It’s a really beautiful, photogenic spot and the only tricky part about the “hike” (the whole thing is probably less than a mile so I’m not sure it qualifies as a hike) is negotiating the rocks and boulders on the last 0.1 miles. I’m not sure if there’s a trail along the entirety of the trip and I haven’t been able to find all that much information about the falls or a possible trail online — I’ll have to check it out when I head back out that way. Waterfall terraces. You can’t really tell from this picture, but some of these “terraces” are actually fairly deep. This is at the very bottom of the main waterfall. 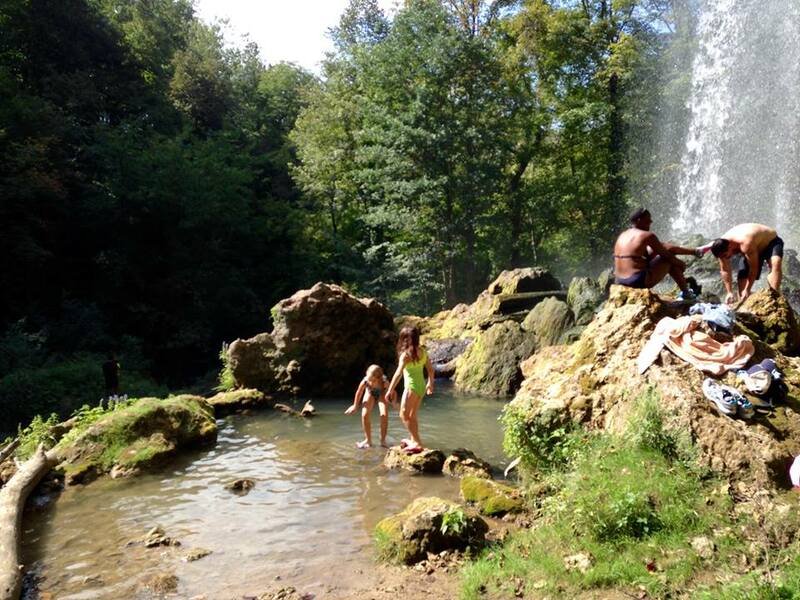 Kids playing at the bottom of the waterfall. 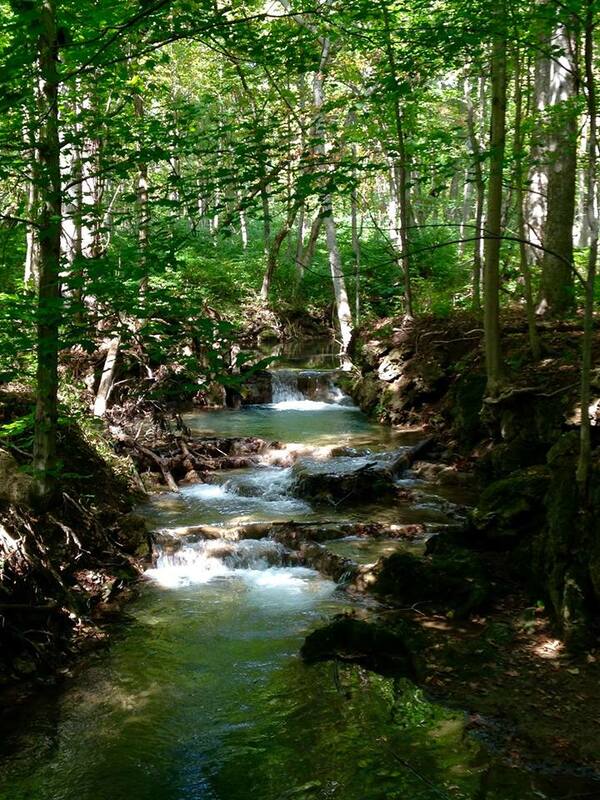 Below the fall, the stream continues into the woods. On the way home, we took a detour to Highland County. I went to the Highland County Maple Festival several winters ago and I remembered it as a very beautiful place. I’ve been wanting to go back for years. We did a scenic drive of the Blue Grass Valley and passed several cattle and sheep farms along the way. 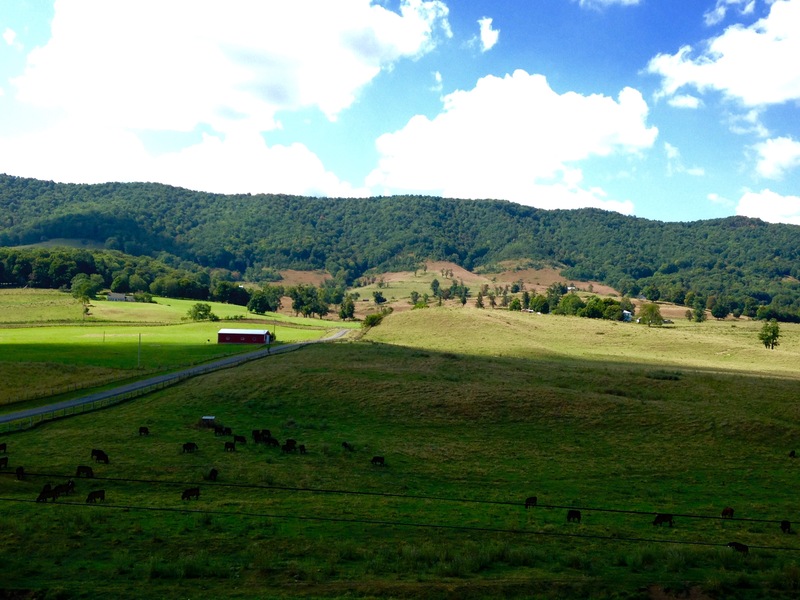 This area of Virginia feels unique because the valleys are actually quite high (1,600-2500) and the farms merge into the mountains. The county calls itself the “Switzerland of Virginia,” and while you don’t get the snow-covered alps, I can see the similarities. Also, with only 2,300 residents, the county holds the title of Virginia’s least populated county. Absolutely verdantly gorgeous places. I especially loved the waterhole picture! Glad I looked for your blog again–for some reason I haven’t gotten your posts so now perhaps I will again.